The game-play is simple: slide a little water droplet around a window-pane, avoid the spikes and collect the pearls. Easy, right? Absolutely, but the beauty of Quell is in the perfectly pitched difficulty curve - it's just taxing enough to test your powers of logic, but never so much so that it stops being fun. The gentle music (by acclaimed composer Steven Cravis) and ambience create the perfect setting to allow your brain to engage fully with these ingenious puzzles. If you're willing to dig deeper still, there's a side narrative which tells a touching story of love, loss and nostalgia. 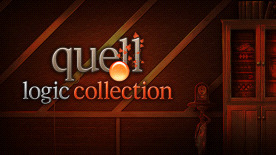 Either way, Quell is a haunting experience that will stay with you long after you've finished it. Quell Memento is an enchanting puzzle game of logic and relaxation. The third and most ambitious instalment of the haunting Quell games, Memento takes the concept to an even deeper level with an engrossing array of new game-play elements. Featuring a breath-taking score by acclaimed composer Steven Cravis, a voice-over narration and beautiful visuals, Quell Memento leads you on an enchanting journey of discovery and nostalgia. The beating heart of the game - the puzzles themselves - are once again perfectly balanced to keep the player enthralled, but never frustrated. Like it's two predecessors, Quell Memento is a haunting experience that will stay with you long after you've finished it.